There’s a crunch of leaves underfoot and a tinge of wood smoke in the air. Monarch butterflies, little jags of flame, meander in a big cerulean sky. Fall’s upon us here in New England. Gone are the high summer patio days that found me grilling quick suppers at 8:30 p.m. The cold snap and early darkness have shut that party down. Now I’m in my kitchen by 6:30 with all the lights burning. It feels too early, in more ways than one. My meals are changing, too. Last spring I was ready for light summer fare—salads, grilled vegetables, cold soups, fresh cheeses—and ready for the crisp white wines that pair with them so well. My autumn kitchen palette is darker and richer: I’m roasting chicken on a bed of garden leeks, rolling out a corn-bacon-Gruyère tart, or sear-roasting pork tenderloin with a cider reduction. 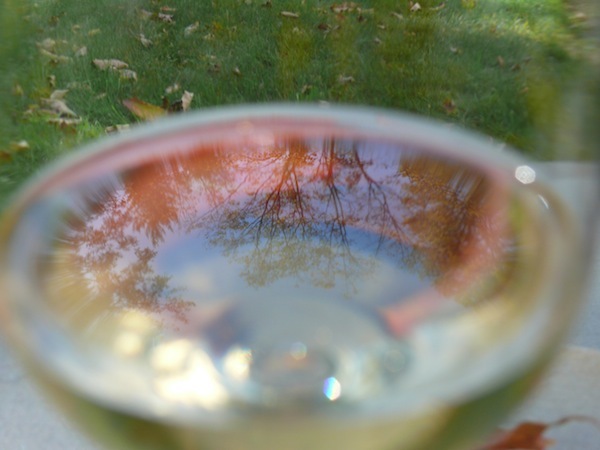 But I’m not ready to give up on white wines—not yet, anyway. I look for whites with bigger body and texture, more pronounced fruit, and spirited aromatics that let them stand up to bold flavors. This also lets me serve them a bit warmer than I’d want in summer. They might skew slightly higher in alcohol, but a little age can add polish and depth, along with a bready savoriness that ties them into earthier dishes. To ensure they’re food-friendly, though, good acidity is key. To fit the bill, some folks might automatically reach for a fuller-bodied Chardonnay, maybe one that’s lively but has seen some oak and undergone the softening of malolactic fermentation. That process also imparts a buttery note that can be pleasant (in moderation) with cream and butter-based sauces, nutty roasted dishes, and rich cheeses. It’s also a style that’s now prevalent in both Europe and the New World, making it easy to find at a wide range of prices. But—can’t we have more fun than that? Buttery, oaky Chard actually pairs well with a pretty narrow range of foods, and I’m looking for more versatility. 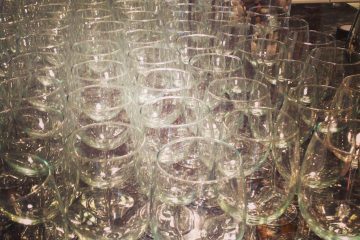 Plus, when you entertain, there’s the ABC crowd to think about: Anything But Chardonnay. Below are a few great alternatives. These are wines that have the gumption to partner with heartier fare, along with a robust Interestingness quotient. 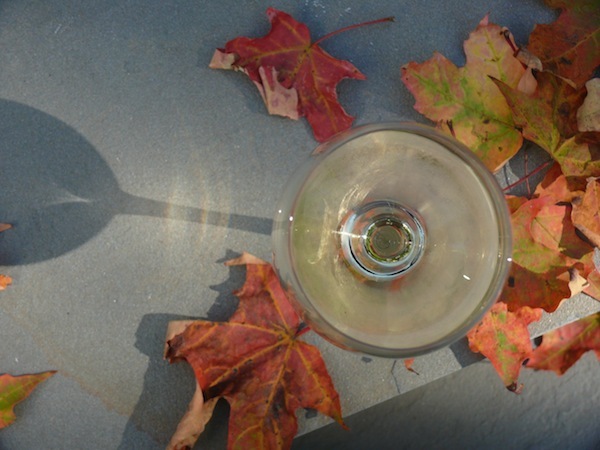 Perhaps my favorite go-to whites for fall are French Rhône and American Rhône-style blends, plus varietal wines made from Rhône Valley grapes, notably Roussanne, Marsanne, Viognier, and Grenache Blanc. The traditionally blended style of the Northern and Southern Rhône allows the winemaker to construct a cuvée that’s beautifully balanced. Roussanne, marsanne, and grenache blanc grapes contribute floral, spice, and honeyed notes, while picpoul, bourboulenc, and clairette contribute acidity, minerality, and gravity. Viognier, which has a luscious apricot fruit flavor, doesn’t usually make an appearance in French Rhône blends, but some American vintners do slip it in. All of these wines tend to be big, typically between 13% and 14.5% alcohol, with pronounced stone fruits (peaches, apricots), pome fruits (apples, pears), wild herbs (lavender, fennel, sage), and terrific mid-palate complexity. The very best have a long, savory finish, and while they’re usually meant to be drunk young, some can age beautifully, integrating and deepening further. These wines also like some air, and a little time in a decanter will make them even more genial. I’ve recently been enjoying a modestly priced French issue, Château Beauchene’s Côtes du Rhône “Grande Réserve” 2010. This blend of roussanne, grenache blanc, clairette, marsanne, and bourboulenc delivers aromas of jasmine and quince, with waxy honeyed notes and bracing acidity. It seems somehow both fat and fresh, and has a languorous finish. It’s also a deal at $16—a price most American Rhône-style blends can’t touch—making it a terrific weeknight wine. 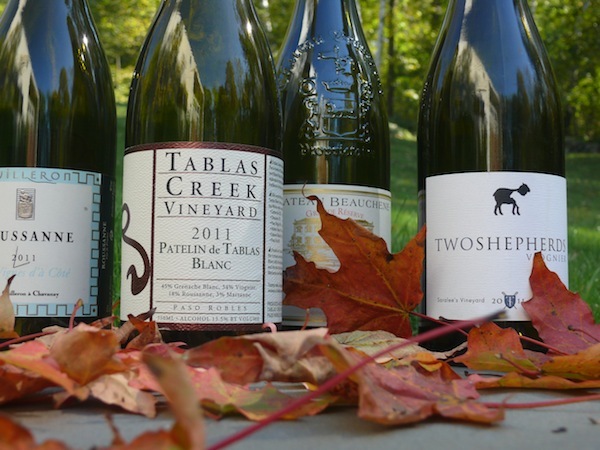 Tablas Creek of Paso Robles uses grenache blanc, viognier, roussanne, and marsanne in its homage to the blended wines of the Rhône, Patelin de Tablas Blanc 2011. Aromas of fresh straw mingle with beeswax, white flowers, oily sage, and apricot. The viognier is quite noticeable here aromatically, along with a pleasant breath of herbs. On the palate it yields savory notes of honeyed pear, quince, and green almond, with modest acidity. This is one of those whites I like to decant. 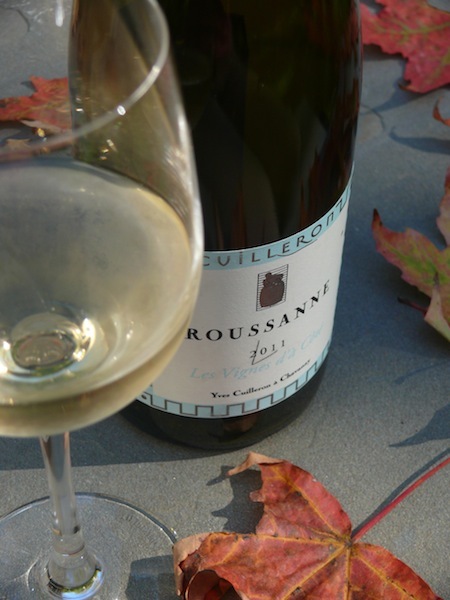 Roussanne is a staple in the blends of the Rhône, particularly in Hermitage, Crozes-Hermitage, Saint-Joseph, and Châteauneuf-du-Pape. When ripe, its berries tend to have a reddish or russet color, which gives the grape its name. 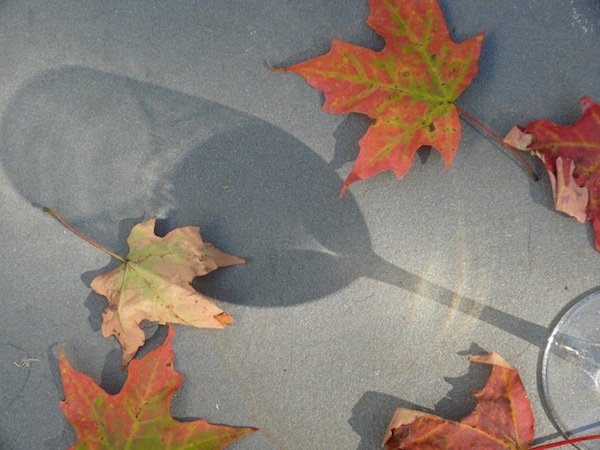 North American plantings are primarily in California and Washington, and these grapes mostly find their way into the blended wines of Rhône Ranger producers: Bonny Doon Vineyard, Tablas Creek, Qupé, Sine Qua Non, and many others. Varietal Roussanne isn’t common, but it’s a wonderful wine with an exotic perfume of wildflower, pear, and spice, and with a bit of aging the wine blossoms and becomes somewhat nutty. This makes it a terrific pairing with nut-crusted fish or poultry, aged cheeses, brown-butter sauces, and risottos with earthy mushrooms and shaved pecorino. It’s a brilliant white for the Thanksgiving table, too. I recently tasted the 2011 Roussanne by Yves Cuilleron, labeled as a humble Vin de France because it was produced outside of the appellation laws. It’s a gorgeous deep gold with ripe aromas of pear, quince, laurel, green tea, and beeswax. Full-bodied but not cloying on the palate, it yields flavors of pome fruits plus resinous herbs. I’d pair it with a savory mushroom strudel, herb-roasted chicken, or white bean stew with sausage and sage. Truchard Vineyards in Napa, California, produces a wonderful, richly textured Roussanne with lively acidity. I once scored a bottle that was about ten years old. I’d ordered the current release from a restaurant’s wine list, but the somm brought an older vintage. Noticing her mistake, she was about to pivot on her heel. “Hold it!” I said. I’m glad I did. That was years ago, but it made me re-think my practice of drinking most California white whites young. Viognier, the grape of Condrieu in the Northern Rhône, has floral aromatics and stone fruit flavors that pair exceptionally well with dishes that incorporate nuts, dried fruits, and spices like cardamom, clove, cumin, and coriander—think curries, tagines, and pilafs. (Steer clear of higher-alcohol Viognier for very spicy foods, though, as the alcohol can intensify the sensation of heat.) I love Viognier with butter-based sauces, poultry, roasted pork loin rolled with apricots, and smoked fish and meats. Although Condrieu is difficult to find in the U.S., several California winemakers produce varietal Viognier bottlings. I find much of it, at the low end anyway, to be somewhat cloying, a little too flabby and one-dimensional. The best, though, can be wonderful, with great freshness and balance. The 2009 DEWN Paso Robles Viognier from Bonny Doon Vineyard (where I used to work) is a good example of how the grape can perform in climes that are a bit warmer than its native habitat. This interpretation offers stone fruit and warm citrus flavors, along with notes of green melon and lavender, plus a lean, minerally finish that keeps it from seeming too pretty and makes it even more versatile at the table. A new favorite California Viognier is the 2011 from Two Shepherds Vineyards. The fruit derives from Saralee’s Vineyard in the cooler-climate reaches of the Russian River Valley, and was picked mature but not overripe to retain its acidity. It’s a true gastronomy wine that exhibits tremendous restraint and minerality—it’s much more like Condrieu than typical California Viognier. Elegant flavors of yellow peach, yellow apple, stone fruit, laurel leaf, and fresh bread mingle with a slight saltiness and tinge of wet stone. Don’t serve it too cold: it’ll show its aromatics best between 55 and 60°F. Really a gorgeous wine. These wines are stylistically somewhat similar: aromatic, cool-climate whites with pronounced acidity. Riesling is a tremendously versatile wine (see my earlier story for more on that), but aged Riesling in particular is a natural for hearty foods like charcuterie, strong cheeses, and spicy cuisine. Sweet Riesling (and—swooning here—aged sweet Riesling) is divine with the apple desserts so prevalent in the fall. Gewürz is distinctly more floral, but makes a wonderful partner for pork, turkey, cheese, pâté, and spicy foods. Two colleagues recommended versions of these wines deriving from the Pacific Northwest, rather than their native Germany (Riesling) or Alsace (Gewürz). Ryan Reichert, Palate Press’s managing editor, suggests a Riesling from the Columbia Valley, Château Ste. Michelle’s Cold Creek Riesling 2011. “The balance between acidity and sweetness is stunning,” he says, adding, “The rich apple and peach flavors demand something succulent, like pork loin cooked with apricots and apples.” At 12.5% alcohol, I think this wine would be great for Thanksgiving, too, when ponderous wines weigh down diners. It sounds perfect to me. 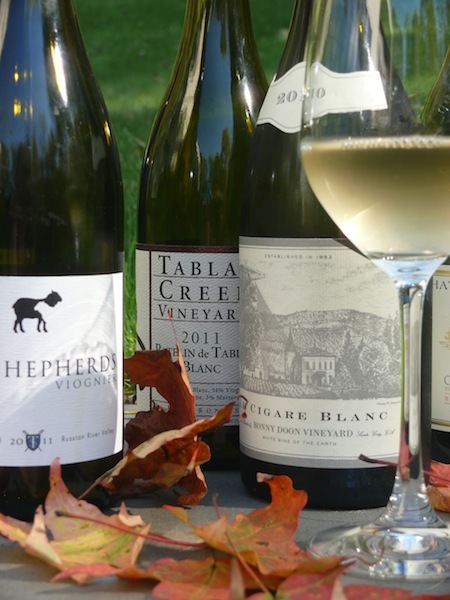 Sure, some of these wines may be a little harder to track down than the ubiquitous Chardonnay. But all will reward you with spirited companionship at your autumn table. Sugar, Part II: What Does Acid Do? Hi – nice article. Remember who is the best Sweet Riesling? Just teasing. Nice to read your work online. Many thanks for the Two Shepherds Viognier love. Almost stopped Viognier a a single varietal, but instead made a decision to make a statement wine, that demonstrates CA Viognier can be bright, high in acid, complex and not flabby, so I made a small production, 25 cases only, which is all I am repeating for 2012 harvest. Cheers to you Meg for your great writing and passion for Rhone whites! Ah, Nicolas, you are a sweet, sly dog. Thanks for reading. William, thanks for the terrific Viognier, and I look forward to tasting the ’12 vintage. Thanks also for the kind words about my evident affinity for Rhônes. The Rhône and I—we go way back.